Gram staining (sometimes called Gram's method) is the method in which bacterial species are differentiated into two groups: Gram-positive and Gram-negative, making it a differential staining method. The name Gram Staining comes from the Danish bacteriology Hans Christian Gram, who developed the microscopy technique. Gram staining differentiates bacteria by the chemical and physical properties of their cell walls and by detecting a thick layer of protein-sugar complexes called peptidoglycans, which are present in Gram-positive bacteria in a layer that makes up 60-90% of the cell wall. Peptidoglycans are present in the cells walls of Gram-negative organisms, but they only comprise 10-20% of the cell wall. In a Gram stain test, Gram-positive bacteria retain the crystal violet dye, while a counterstain (often safranin or fuchsine) added after the crystal violet gives all Gram-negative bacteria a red or pink coloring. Gram staining is almost always the first step in the identification of a bacterial organism. While Gram staining is a valuable diagnostic tool in both clinical and research settings, not all bacteria can be definitely classified by this technique. 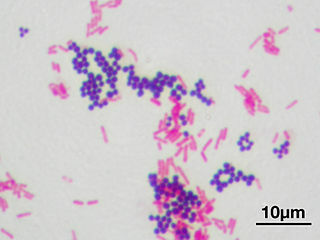 The image above shows both Gram-positive bacteria (in purple) and Gram-negative bacteria (in pink). The microscope image is of Staphylococcus aureus (Gram-positive, purple) and Escherichia coli (gram-negative, pink) and was captured under a biological microscope at 1000x magnification. 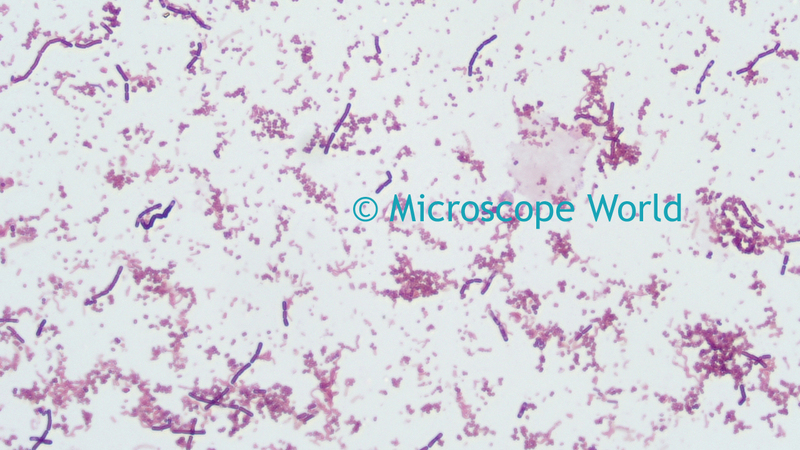 Gram stain of 3 types of bacteria captured at 400x under the RB30 biological microscope. The image above is of 3 different types of bacteria with a Gram stain applied to the prepared slide. The image was captured using a 40x Plan Fluor objective lens on the RB30 biological microscope. Austin Community College provides further information on staining procedures in a printable document here.